Before the Challenger came out, Gemini products were based around the Z80 processor and the company's 80-bus architecture. They did well in applications where costumers wanted a highly-specialized product. 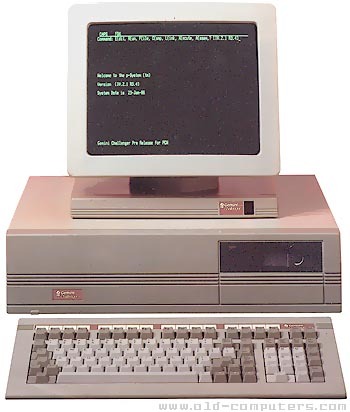 At first sight, the Challenger looked like an ordinary PC-compatible computer. The monitor was a Wyse WY-50 remote terminal finished as the same colours as the main box. However, the Challenger's main processor was a 12 MHz Motorola 68000 linked with 512 KB of RAM. This configuration made the Challenger a very high speed 16-bit system for the time. While designing the Challenger, Gemini designers also created a new 68000 proprietary bus called 68K, which was originally a 16-bit bus but was later extended to 32-bit when the 68020 became available. Four 68K slots were available on the Challenger mainboard. They also designed an impressive graphic card based on the Hitachi HD63484 graphic processor and consisting in two piggy-back full length cards plugged into a 68K slot. Maximum resolution was 1024 x 1024 pixels with 16 million available colours. - CP/M 68k, the 68000 version of the 8-bit O.S. which was never very popular. Each of these O.S. could cohabit into several partitions of a same hard disk. Despite it's advanced features, the Challenger never met success, neither as a businness machine as very few software were developped for it, nor as a development system as the 68K bus never was carried by other manufacturers. The last machine made by Gemini was a beautifully built IBM clone using a motherboard designed by British Aerospace. But it was too expensive and couldn't compete against far east production. Gemini finally disappeared about one year after the Challenger was launched. see more Gemini Challenger Ebay auctions !